1 What but Christ's vision would I use today when it can offer me a day in which I see a world so like to Heaven that an ancient memory returns to me? Today I can forget the world I made. Today I can go past all fear and be restored to love and holiness and peace. Today I am redeemed and born anew into a world of mercy and of care; of loving kindness and the peace of God. 2 And so, our Father, we return to You, remembering we never went away, remembering Your holy gifts to us. In gratitude and thankfulness, we come, with empty hands and open hearts and minds, asking but what You give. We cannot make an offering sufficient for Your Son. But in Your Love the gift of Christ is his. 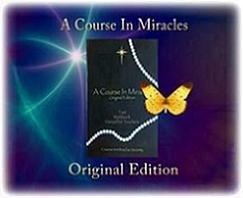 A Course in Miracles truly is a radical path. There is no grey area. Truth is true and nothing else is true. In this Lesson, we affirm that Christ is all I seek today. We are reminded that there is nothing else of value but to know our true Self. Separation is the decision not to know who we are. Now we choose to know the Self and to recognize that only what is eternal is worth seeking. Yet for most of us, there are still other things we seek. It is not helpful to feel guilty about this, but we simply need to acknowledge how much fear and resistance we have to the love, holiness, and peace that is our natural inheritance. Jesus tells us, "And if you find resistance strong and dedication weak, you are not ready. Do not fight yourself." (T.30.I.1.6-7) (ACIM OE T.30.II.2) Putting demands on ourselves is not helpful. Jesus never demands. All demands come from the ego. What is helpful to our journey through this Course is to trust the process. "You are perfectly safe as long as you are completely unconcerned about your readiness, but maintain a consistent trust in mine." (T.2.V.4.209) (ACIM OE T.2.III.64) With dedication and consistent practice, when you are ready, the truth will dawn on your mind. Most of us still look outside of ourselves for happiness in the belief there are still things in the world that will complete us. We are not yet convinced that all we want to know is the Christ Self that we are. Our minds are split, and while we continue to follow this path and still seek outside of ourselves for completion, we will feel increasing conflict. Yet as we step more and more firmly on the path to awakening, we experience more and more peace until our desire for things to go our way increasingly falls away. Every personal goal I have today is secondary to the primary purpose for the day. Our only purpose today is to "go past all fear, and be restored to love and holiness and peace." (W.306.1.3) In any situation where I find myself today, I will try to remember that it is the gift of Christ I seek in every encounter. It changes the kind of day we have if we can remember our purpose, regardless of what seems to be happening in our day. It is good practice to commit the mind to remembering purpose whenever fear arises in any form. We are called to remember that we will be "restored to love and holiness and peace" (W.306.1.3), when we go past all fear. It all depends on our willingness. There is nothing to seek. The love, holiness, and peace are already in us. Our fear and resistance keep us from being aware of our eternal condition. Our own goals are based on the belief that there are things in the day that can bring us something we want. They are based on the illusion that we are in control of our lives. Yet events seem to just happen. We can't plan for what is given. We need to trust that everything happening in our lives provides the opportunity to continue to learn to forgive. Thus, everything is orchestrated for us, and by us, for our good. We will be much more willing to accept whatever shows up when our purpose is held firmly in the mind. Jesus tells us there is nothing we can offer ourselves that will ever substitute for the peace already in us. Today, I am grateful my way of seeing is wrong, and I turn to the Holy Spirit, asking for help to see through the eyes of Christ. I am grateful there is nothing to seek. The truth of what I am is already present in my mind. I am grateful for the willingness to do the work of uncovering the blocks to the truth I hold in my mind. I am grateful that I am patient with myself in this process, knowing I am using time for the purpose of healing. I am grateful for whatever shows up in my day, recognizing that it can all be used for healing. There is nothing good or bad about my day. I can be a happy learner, allowing it all to be used for healing purposes. I am grateful that I can look at my dark thoughts without judging myself for them, knowing they can be healed only when I am willing to bring awareness to them. I am grateful that I can always turn inward for inspiration because what I use for hate, the Holy Spirit uses for love. I am grateful that I can always rely on His Love within me. All power of our Creator is in each one of us. The gift of Christ is all I seek today.